Unless you've been hiding under a rock, you've probably already seen this video making the rounds on facebook, but I just love it and it's my blog, so I'm putting it here anyway. 'Weird Al' Yankovic is a master of parody. He's actually a very talented musician and wordsmith, too. And now when that annoyingly catchy tune gets stuck in my head, I have some fun non-misogynistic words to sing to it. Thanks, Al! While you're at it, check out 'Tacky' (his parody of Pharrell's 'Happy'), 'Handy' (his parody of Iggy Azalea's 'Fancy'), and 'Foil' (his parody of Lorde's 'Royals'). ~Shakespeare, "A Midsummer Night's Dream"
On Wednesday, we discovered a little baby bunny hanging around the logs that border our driveway. No adult rabbits were anywhere to be seen, so we just let it be, hoping it would find its way home. 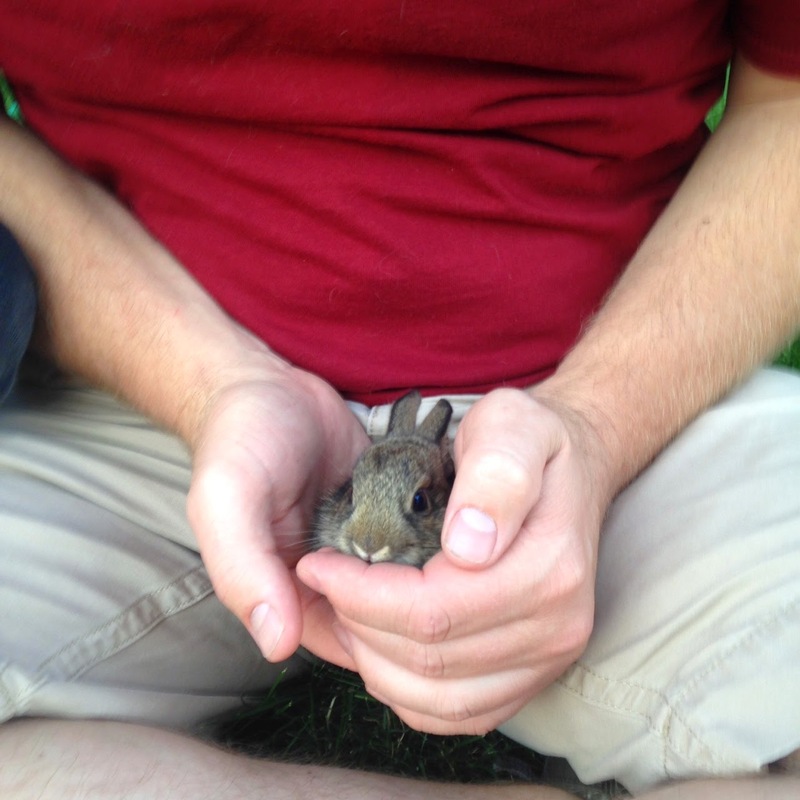 However, it was still there in the evening and my younger two boys went out to watch the adorableness of a baby bunny. Then Scrimper, our magnificent hunter-cat, discovered it. Josh came running inside to get Gene to save the bunny while Evan tried desperately to catch the cat. Fortunately, Scrimper must not have been hungry; she was more interested in playing with the bunny for the time being. Gene fished her out from under the car and, under great feline protest, deposited her inside the house. He then managed to get a hold of the bunny. 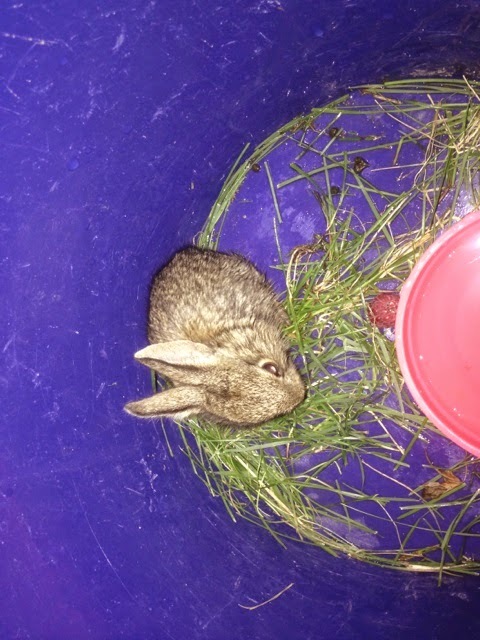 The baby bunny, newly christened Hopster, was then set up in the posh accommodations afforded by a five-gallon bucket, including plenty of grass, a few raspberries, and a bowl of water, which he promptly hopped into. After careful consideration (and parental refusal of the multiple, repeated pleas 'Can we keep him, pleeeeeeeeeeeeeeeease???? '), we found him a relatively safe place near the shed that provides plenty of small spaces for hiding. For those interested, the answer to the final phrase in #3 is approximately 48 hours.